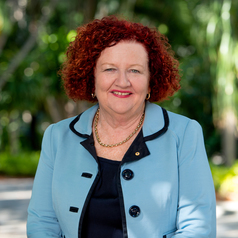 Professor Margaret Sheil joined QUT as Vice Chancellor and President in February 2018. Previously Margaret Sheil was Provost at the University of Melbourne from 2012 to 2017. From 2007 to 2012, Professor Sheil was the Chief Executive Officer of the Australian Research Council (ARC) and led the development of a range of new funding schemes and the Excellence in Research for Australia evaluation of Australian University Research. She is a Fellow of the Royal Australian Chemical Institute (FRACI) and the Academy of Technological Sciences and Engineering (FTSE) and a member of the Advisory Council of the CSIRO Science Industry Endowment Fund (SIEF). She is a member of the Clunies Ross Awards Committee of ATSE. She has previously been a member of the Prime Minister’s Science, Innovation and Engineering Council, the National Research Infrastructure Council and the Cooperative Research Centres Committee. Prior to joining the ARC, Professor Sheil had been Deputy Vice-Chancellor(Research), Dean of Science and a Professor of Chemistry at the University of Wollongong and held research positions at the Australian National University and the University of Utah USA. She has a PhD and BSc(Hons) in Chemistry from the University of New South Wales.